This post was created by Jane Bristow, managing director of Sodexo Education and Sodexo Women’s International Forum for talent member. The post was first published on the Opportunity Now blog. For too long now, flexible working has been seen by many employers as a luxury. A favour they grudgingly provide for employees, who in turn will find it difficult to progress up the organisation. Hopefully – for employers and employees, the one-year anniversary this week of flexible working legislation introduced in UK is one more step away from such regressive thinking. 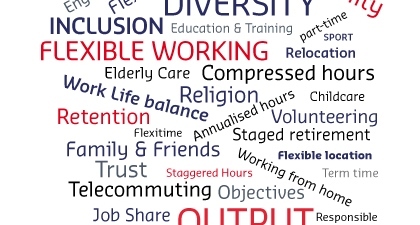 Research published earlier this month found 14 million people in Britain are looking for flexible work arrangements. Increasingly, offering employees flexible working is essential to keep businesses competitive with an ability to attract the best talent. Sodexo is the eighteenth largest company in the world. The scope and diversity of our operation is so tremendous it would be impossible to operate effectively by locking everyone into a rigid ‘nine-to-five’ culture. Employees who enjoy a positive work-life balance will perform well, and be far more likely to bring enthusiasm and humility to their role. In my position with the Sodexo Women’s International Forum for talent (SWIFt), which brings senior leaders together from around the globe to drive gender balance, I have worldwide accountability for ‘flexibility’. This is one of six workstreams overseen by SWIFt. This week I’m running a webinar for our UK business advocating flexible working, asking employees and line managers to consider the impact of caring for children and other relatives, and also for line managers in particular to consider the outlook of younger colleagues who just don’t want to work in the same way as previous generations. We are also sharing a flexible working case studies booklet across the business, highlighting real employee stories from around the world and how they have achieved work-life balance. Many employees can be reluctant to approach their manager about flexible working for fear it may harm their work prospects. It’s important organisations champion flexible working and the importance of diversity inside and outside the business not only to improve their employees’ quality of life, but to attract and retain the best talent.